Book with us directly and enjoy the extras you won't find anywhere else! £25 food & drink on us per booking, to be used in any of our bars or restaurants. Best rate guarantee – if you find a better price elsewhere, we’ll match the rate. The Guest Rating Score™(GRS™) is an independent assessment of this hotel&apos;s quality rating based upon consumer reviews from around the internet. Provided by ReviewPro the leading provider of online reputation management analytics for the hotel sector, the GRS™ offers a complete and unbiased measurement of this hotel&apos;s online reputation. SPRING IT ON - 20% DISCOUNT! Make the most of the weather, as the nights get longer and the days get brighter, with 20% off and a minimum two-night stay in the heart of the Capital. 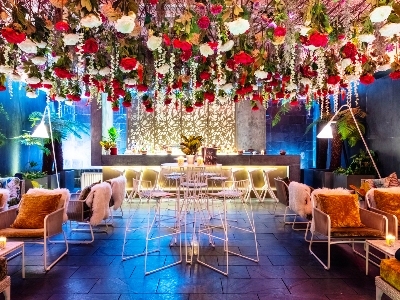 Whilst you’re here, enjoy cocktails up on our dazzling rooftop terrace in Angler, or hideaway in the Enchanted Garden under a sky full of flowers whilst you have a blooming good time.